Is is possible to think right about wrongdoing? If I do wrong, I’m going to suffer the consequences of that. God doesn’t treat people differently in this regard (Col 3:25 ). God give us assurance that we can live that good life. 2 Peter 1:3 teaches us that we can live a Christian life because the Bible equips us to do so. Further, the Christian is equipped to all good works by the Bible (2 Tim 3:5–16). Thinking Wrong about Doing Wrong. King Saul was the first king of Israel and he gave us a good example about thinking wrong about doing wrong. God had instructed Saul to destroy everything in Amalek (1 Samuel 15:3) but he didn’t. Instead, Saul brought the king back alive and kept the best of the spoils (1 Samuel 15:9). Saul tried to justify himself by thinking he knew better than God to keep the good things instead of destroying them (1 King 15:15). Did Saul think, “God must have not realized how good these things are?” Saul was wrong even though he thought he had a good reason. So Samuel replied with the famous verse, “Behold, to obey is better than sacrifice.” (1 Samuel 15:22). Do we also think we know better than God? Do we ignore God’s instructions on things even in attempt to be pleasing to God? It’s never right to disobey God in any matter and we should never attempt to justify our wrongdoing. Thinking Wrong about Doing Right. Ananias and Sapphira sold land and gave money to the church from the proceeds. Barnabas had done the same thing and was well received. So Ananias and Sapphira also wanted the praise that came from that but also wanted the money. So they lied and said they gave the entire amount to the church (Acts 5:1–11). Jesus addressed this issue directly, instructing that giving is between you and God, not something to be praised for (Matthew 6:1–4). God never wants us to do good for the wrong reason. Jesus also taught that doing things grudgingly, even though their actions are right, is not pleasing to God. Although we serve God out of a sense of duty, it is also out of love and respect for God. Without that motivation, we are empty and useless to God (1 Cor 13:1–3). Thinking Right about Doing Right. Abraham was told to leave the land of his forefathers and travel to a new place that God would show him. Abraham left his roots and his home and had such faith in God that he left everything behind to go to a strange place. God told Abraham that he would have a son at an old age and that all the world would be blessed through him. Yet Abraham was told in Genesis 22:1–2 to sacrifice his only son — that son of promise. God tested Abraham and Abraham had the faith that if God promised that his son would be the seed of a great nation that God would raise him from the dead. So despite the pain, Abraham put his hand to the work that God commanded. He had a relationship with God and trusted what God said. 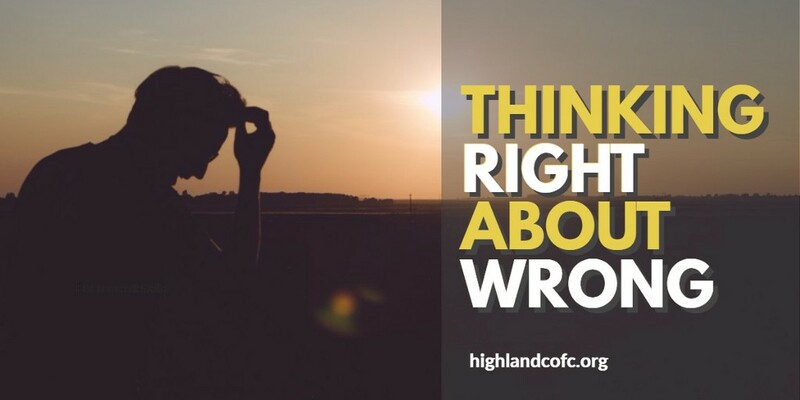 Do you have the proper relationship with God that allows you to think right about doing the right thing, even when it’s hard? Thinking Right about Doing Wrong. We realize that none of us are perfect so we need the right mindset about evil so that we keep from sinning. David serves as a good model in 2 Samuel 11. David committed adultery and killed a man to cover up his sin. With the prophet Nathan confronted David about it, David faced his sin. So he had a choice as to how he would think about the wrong he had done. Psalm 51:1–4 explains that David was sorrowful and penitent. The right way of thinking about sin is to pray and repent of it (1 John 1:8–9, James 5:16). We need to examine ourselves on an ongoing basis to ensure we think right about doing wrong. When we do sin, we have to turn from it and repent in order to get back right with God. Do you examine yourself daily to evaluate where you stand with God? Be diligent to make your election sure so that you do not fall (2 Peter 1:10). All of us who are accountable to God have a problem of sin. The way we think about it is seriously important because it determines how we are received by God.